Art Bureau - ZineWiki - the history and culture of zines, independent media and the small press. 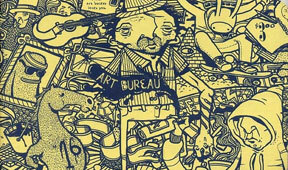 Art Bureau is an art zine fostering a grassroots approach in promoting artists, graphic designers and the art community. The zine's half-size, landscape-format, provides ample room for artwork and articles about artistic collaborations, networking and art organizations. Since 2002, Seventeen issues have been published. Contributors include: Kelsey Brookes, Katy Horan, Linzie Hunter, Hannah Stouffer, Daria Tessler, Junichi Tsuneoka, Bubi Au Yeung and others. This page was last modified on 11 January 2010, at 18:59.